The 2017 Honda Fit is well-loved across Goshen and Monroe thanks to its expansive and versatile interior, but drivers have also been unfailingly impressed by the high mpg ratings achieved by its powertrain. With a standard direct-injection engine and a choice of two sophisticated transmission systems, the Fit has experienced few problems outpacing the rest of the hatchback segment. The 2017 Honda Fit might be the smallest vehicle that the manufacturer produces for American consumers, but it packs plenty of punch when you hit the gas thanks to a 1.5L direct-injection 1.5L in-line 4-cylinder engine. It puts up to 130-hp and 114 lb.-ft. of torque at your disposal. Those are phenomenal numbers for a vehicle in this class, and they allow the Fit to perform above and beyond the competition. Additionally, the vehicle’s ride has been optimized for versatility: you’ll find yourself enjoying city driving more than ever thanks to the Fit’s fleet-footed acceleration, but highway driving is just as impressive due to a steady, controlled, and remarkably quiet cruising range. 6-Speed Manual Transmission: Manual transmissions remain preferable for drivers who enjoy the power to control shifts themselves. 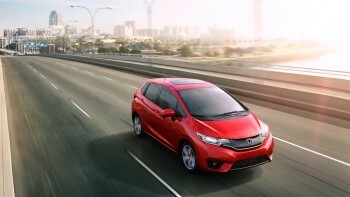 The Fit will make up to an impressive 29 mpg in the city and 36 mpg on the highway with 6-speed manual equipped*. Continuously Variable Transmission (CVT): CVT systems essentially combine the effortlessness that comes with automatic with the efficiency of a manual. Expect up to a jaw-dropping 33 mpg in the city and 40 mpg on the highway with the LX trim*. With most vehicles, the powertrain would be the whole picture when it comes to efficiency and performance, but the 2017 Fit has been kitted out with a number of additional amenities to improve your drive. Drive-by-Wire System: The Fit’s adoption of a drive-by-wire throttle system reduces weight while improving operational accuracy and reducing the regularity of service appointments. Paddle Shifters: Add paddle shifters to your CVT system for a race-inspired ride and the ability to manually adjust your gear ratio. Eco Assist System: Hitting the Eco Button will optimize the Fit’s systems to prioritize efficiency. You can also use the Eco Coaching panel to make changes to your driving style that will help noticeably reduce fuel consumption rates. While taking a look at the specs of the 2017 Honda Fit can certainly hint at its potential, nothing is going to beat coming down to Middletown Honda today to organize a test drive. Looking for a new Honda model? Explore the 2019 Fit mpg ratings as well! * 29 city/36 highway/32 combined mpg rating for LX and EX 6MT models. 33 city/40 highway/36 combined mpg rating for LX CVT model. 32 city/37 highway/34 combined mpg rating for EX CVT and EX-L models. Based on 2017 EPA mileage ratings. Use for comparison purposes only. Your mileage will vary depending on how you drive and maintain your vehicle, driving conditions and other factors.